Fertigator FertyMega-1FOG-PVC FertyMega-1FOG-PVC fertigation unit is designed for the proportionally-dosed addition of complex fertilizers, trace elements, stimulants, chemical and biological plant protection products to sprayed water using sprinklers and foggers in greenhouses for foliar dressing of plants and treatment of the leaf surface with these products by spraying water and fogging systems . FertyMega-1FOG-PVC provides optimal parameters for the supply of fertilizers with irrigation water when growing plants on hydroponics and soil. The maximum productivity is 5.0 cubic meters of water per hour. With the help of this device, plants can be cultivated in an area of ​​up to 3 hectares. 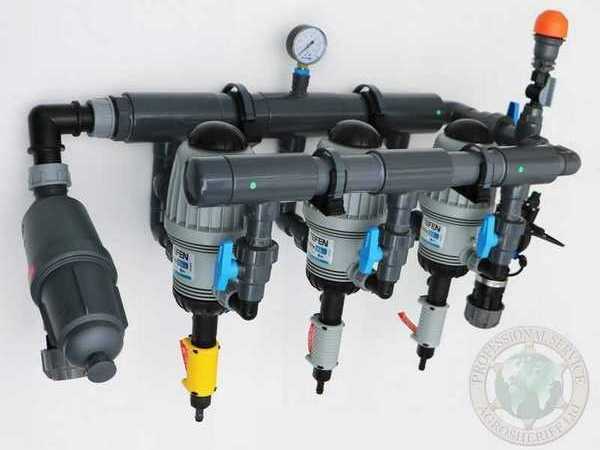 Set of parts for FertyMega-1FOG-PVC Specifications: Name Parameter Maximum capacity: (maximum water flow) 5.0 m³ / h Minimal productivity: (minimum water flow)5 0 liters / hour >Minimum working pressure> 2.5 Bar Maximum working pressure 4.5 Bar Working temperature from + 5ºС to + 60ºС Attention! Operation of the system is allowed only at positive temperatures. A drop in temperature below 0 ° C can lead to defrosting and system failure. 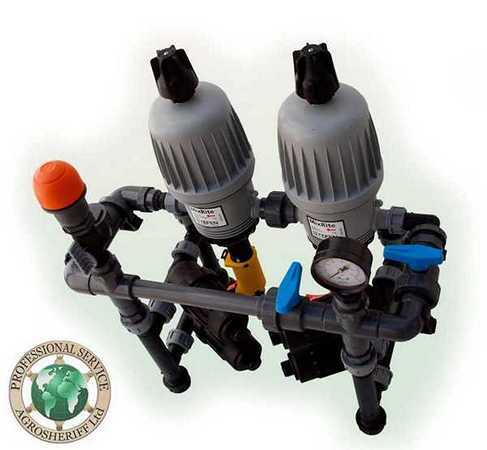 The fertigation unit is supplied complete and is designed for easy and simple self-assembly. All parts are made of high-quality PVC plastic with protection from UVA, which allows you to install equipment outdoors without additional cover. The advantage of this fertigation unit is the possibility of separate addition of two types of fertilizer or fertilizer + acid. A block of filters is installed in front of the fertigation unit to prevent clogging of the pump, reduce wear of mechanical parts and prolong the life of the system. At the exit from the fertigation unit, a filter unit is also installed for final fine water purification with added fertilizers. ATTENTION!It is necessary to monitor the presence of a solution of fertilizers in tanks with a mother liquor, tk. the operation of the dosing pump "idle" can lead to increased wear or the output of the dosing pump. Equipment: Name Number of MixRite 5,0 1 PC Filter mesh (optional) 1 PC Block of ultra-fine filter disc filters 55 micron 1 PC Strapping on the basis of PVC fittings and fittings 1 kit Spare parts and accessories (Repair kit) 1 kit Tubes for the supply of fertilizers and spare parts for the FertyMega-1FOG-PVC Fine filtration unit 55 microns for FertyMega-1FOG-PVC Fertigators of all modifications are delivered directly from Israel. Delivery is carried out in any country of the world. The cost of delivery is determined by the tariffs in force at the time of delivery. 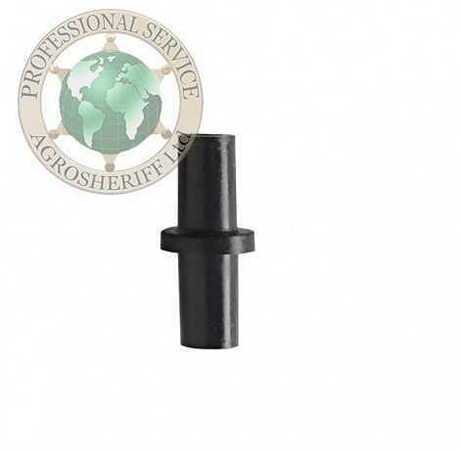 Company Agrosheriff ltd. constantly improves its products in order to improve their technical characteristics, operability and functionality, in this connection the company reserves the right to insignificantly change the configuration of the binding of a specific Fertigator. FN-Compact-1-1.0 Fertigation UnitNew compact FN-Compact-1-1.0 fertigation unit is designed for proportional-dosed addition of fertilizers to irrigation water in small and medium-sized greenhouses, in small areas of open ground, and also provides minimum requirements for growing plants on hydroponics.Specifications:	Name	Parameter	Maximum capacity: (maximum water flow)	1.0 m³ / h	Minimal productivity: (minimum water flow)	20 liters / hour	Minimum working pressure	1.5 atm	Maximum working pressure	6.0 atm	Working temperature	from + 5ºС to + 60ºС	Attention! Operation of the system is allowed only at positive temperatures. A drop in temperature below 0 ° C can lead to defrosting and system failure.The fertigation unit is supplied complete with strapping, which allows it to be easily and quickly connected to the water source and irrigation system with threaded connections. The cranes included in the bundle are intended for switching the modes of operation of the fertigation unit: watering with clean water and watering with the addition of fertilizers. All parts of the strapping are made of polypropylene with UVA protection, which allows you to install the equipment even in the open air without additional shelter from the sun. Recommended: install a filter in front of the fertigation unit to prevent clogging of the pump, reduce wear on mechanical parts and prolong the life of the system. It is also recommended to install a filter at the output of the fertigation unit for final fine water treatment with added fertilizers. ATTENTION! It is necessary to monitor the presence of a solution of fertilizers in tanks with a mother liquor, tk. the operation of the dosing pump "idle" can lead to increased wear or the output of the dosing pump.The package includes:Equipment:	Name	Number of	MixRite 1.0 for fertilizers	1 PC	Irrigation CONTROLLER GEVA-75W	1	Disc Filter, Valve and Fittings	1 kit	Ferti fertigation units of all modifications are supplied directly from Israel. Delivery is carried out in any country of the world. The cost of delivery is determined by the tariffs in force at the time of delivery.Company Agrosheriff Ltd. constantly improving its products in order to improve their technical characteristics, operability and functionality, in this connection the company reserves the right to insignificantly change the configuration and details of the strapping without degrading the product's parameters. The fertigation unit in the collection, complete with filters, is ready for installation in a greenhouse or on beds. Блок фильтров SET 2S-1.5Compact Сечатые фильтры тонкой очистки воды производительностью до 30 м3/час.Фильтры позволяют получить высокую стандартную для систем капельного орошения степень очистки воды - 130 микрон, что даёт возможность использовать их в качестве фильтров в профессиональных системах ирригации. Степень фильтрации высокая и качаство воды отвечает стандартам. В качестве фильтрующего элемента используется сетчатый фильтрующий элемент из нержавеющей стали, прочный и надежный.Комплект сдвоенного блока фильтрации поставляется с послным набором фитингов, кранов и коннекторов. Вы можете его собрать за несколько минут.Дополнительное преимущество состоит в том, чтофильтры можно промывать без разборки, а полную промывку и чистку производить достаточно редко, но уже с полной разборкой. Фильтры можно использовать на открытом воздухе только при положительных температурах!When assembling the filter unit, be careful. All plastic connections have built-in seals. 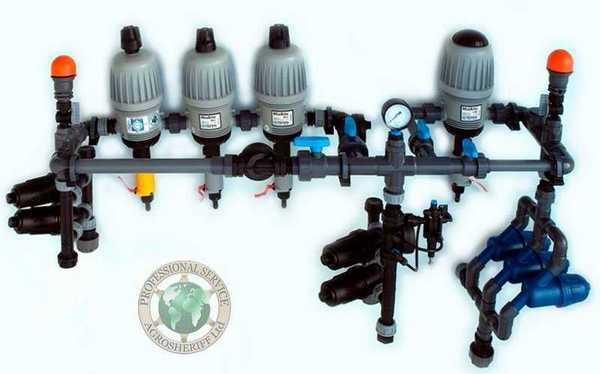 When assembling, use moderate physical effort, so as not to damage the plastic parts of the kit.When the filter element is completely cleaned, use detergents and brushes or brushes.Complete cleaning with disassembly of filters is carried out according to the schedule set by you and without fail, after the end of the irrigation season.Keep filters out of office hours in a dry and clean condition. Fertigator FertyNorm-3P-PVCFertyNorm-3P-PVC fertigation unit is designed for proportionally-dosed addition of fertilizers and acid to irrigation water in medium-sized and field-grown greenhouses. FertyNorm-3P-PVC provides optimal parameters for the supply of fertilizers with irrigation water when growing plants on hydroponics and soil. The maximum productivity is 7.5 cubic meters of water per hour. 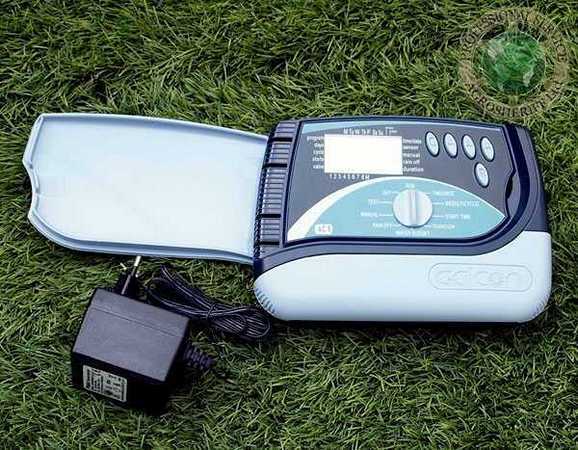 With this device you can water and fertilize up to 6 hectares. 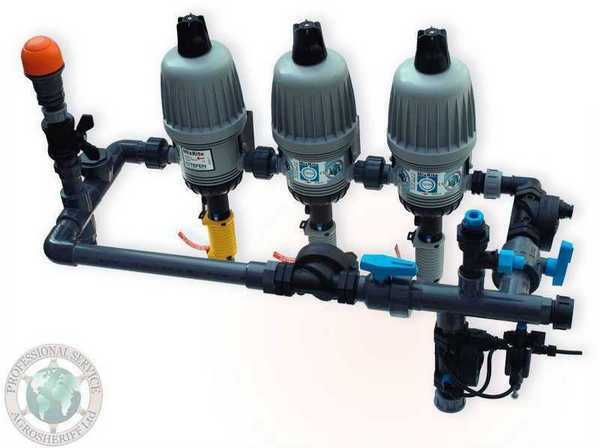 Set of parts for FertyNorm-3P-PVCSpecifications:	Name	Parameter	Maximum capacity: (maximum water flow)	7,5 m³ / h	Minimal productivity: (minimum water flow)	90 liters / hour	Minimum working pressure	1.5 Bar	Maximum working pressure	4.5 Bar	Working temperature	from + 5ºС to + 60ºС	Attention! Operation of the system is allowed only at positive temperatures. A drop in temperature below 0 ° C can lead to defrosting and system failure.The fertigation unit is supplied complete and is designed for easy and simple self-assembly. ATTENTION!It is necessary to monitor the presence of a solution of fertilizers in tanks with a mother liquor, tk. the operation of the dosing pump "idle" can lead to increased wear or the output of the dosing pump.Equipment:	Name	Number of	MixRite 2.5 for fertilizers	2 pcs	MixRite 2.5 bypass for acid or second type of fertilizer	1 PC	Filter mesh (optional)	1 PC	Disk filter (optional)	1 PC	Strapping on the basis of PVC fittings and fittings	1 kit	Spare parts and accessories (Repair kit)	1 kit	Tubes for the supply of fertilizers and spare parts for the FertyPar-7.5AS Ferttor.Fertigators of all modifications are delivered directly from Israel. Delivery is carried out in any country of the world. The cost of delivery is determined by the tariffs in force at the time of delivery.Company Agrosheriff ltd. constantly improves its products in order to improve their technical characteristics, operability and functionality, in this connection the company reserves the right to insignificantly change the configuration of the binding of a specific Fertigator. 10 atm. Thread: standard B.S.P.T Dimensions: 1.5in. Throughput: 15 cubic meters per hour. Filter element: Grid. Degree of filtration: 120 mesh. The case material is polypropylene. The mesh material is stainless steel. Rubber gaskets - EPDM. Filter unit SET 2-1.5. Sechatye filters fine water capacity of 30 m 3 / hour. Filters allow to obtain a high standard for drip irrigation degree of water purification systems - 130 microns , which enables their use as filters in professional irrigation systems. The degree of filtering high and kachastvo water meets the standards. 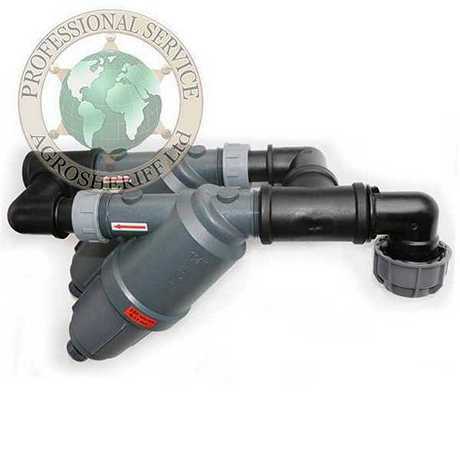 As the filter member used strainer element in stainless steel, durable and reliable.Kit Dual filter unit is supplied with a set poslnym fittings, valves and connectors. You can assemble it in a few minutes.An additional advantage is that chtofiltry can be washed without dismantling and complete washing and cleaning is quite rare, but with a complete disassembly. The filters can be used outdoors only at positive temperatures!Во время сборки блока фильтров, будьте внимательны. Все пластиковые соединения имеют встроенные уплотнения. При сборке, применяйте умеренные физические усилия, что бы не повредить пластиковые детали комплекта.При полной очистке фильтрующего элемента, применяйте моющие средства и щетки или кисти.Полную очистку с разборкой фильтров проводите по установленному вами графику и в обязательном порядке, после завершения поливного сезона.Храните фильты в нерабочее время в сухом и чистом состоянии. FN-Compact-1S-PVC Fertigation UnitNew compact FN-Compact-1S-PVC fertigation unit is designed for proportional-dosed addition of fertilizers to irrigation water in small and medium-sized greenhouses, in small areas of open ground, and also provides minimum requirements for growing plants on hydroponics.Specifications:	Name	Parameter	Maximum capacity: (maximum water flow)	2.5 m³ / h	Minimal productivity: (minimum water flow)	30 liters / hour	Minimum working pressure	0.5 atm	Maximum working pressure	6.0 atm	Working temperature	from + 5ºС to + 60ºС	Attention! Operation of the system is allowed only at positive temperatures. A drop in temperature below 0 ° C can lead to defrosting and system failure.The fertigation unit is supplied complete with strapping, which allows it to be easily and quickly connected to the water source and irrigation system with threaded connections. ATTENTION! It is necessary to monitor the presence of a solution of fertilizers in tanks with a mother liquor, tk. the operation of the dosing pump "idle" can lead to increased wear or the output of the dosing pump.The package includes:Equipment:	Name	Number of	MixRite 2.5 for fertilizers	1 PC	Strapping on the basis of PVC fittings and fittings	1 kit	Ferti fertigation units of all modifications are supplied directly from Israel. Delivery is carried out in any country of the world. The cost of delivery is determined by the tariffs in force at the time of delivery.Company Agrosheriff Ltd. constantly improving its products in order to improve their technical characteristics, operability and functionality, in this connection the company reserves the right to insignificantly change the configuration and details of the strapping without degrading the product's parameters. The fertigation unit in the collection, complete with filters, is ready for installation in a greenhouse or on beds. Used for irrigation of trees with medium/small root zone. Can be installed in upside down position for reduced wetting diameter. 40-160 liters per hour (0.154-0.704 gpm). Fertigation unit FertyNorm Compact AR-2S-PVC-CTFertigation unit FertyNorm Compact AR-2S-PVC-CT for proportional dosing addition of fertilizers and acid in the irrigation water in greenhouses of small and medium-sized, small areas of open field. FertiNorm Compact AR-2S-PVC-CT allows to provide the minimum necessary requirements for growing plants hydroponically. 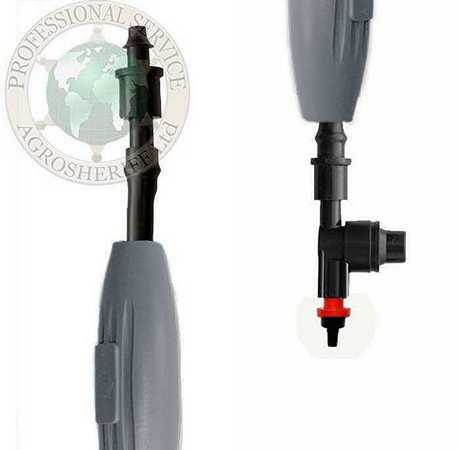 Technical information:	Description	Rate	Flow rate	7 - 2500 l/h	Water pressure	0.2 - 8 bar	Working temp	+4ºС - +40ºС	Attention! System operation is allowed only at positive temperatures. 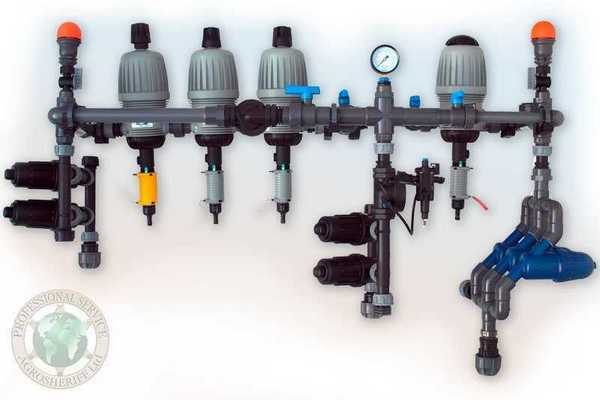 The drop in temperature below 0 ° C may cause defrosting and system breakdown.Fertigation unit comes as kit for self-assembly, allowing you to easily and quickly connect it to the water source and to the irrigation system using threaded connections. 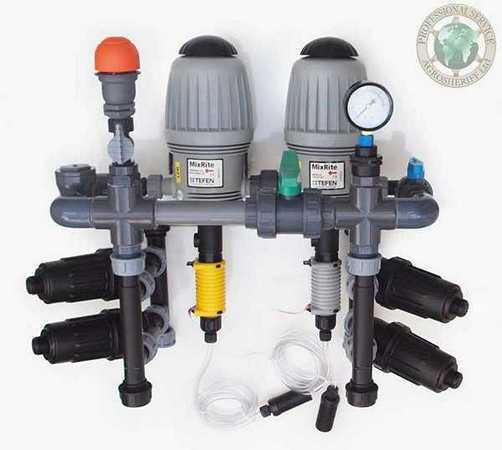 By using the valves, included in the kit, it is possible to switch fertigation modes: watering with pure water and watering with the addition of fertilizers. All parts are made of PP with protection against UVA, which allows installation even in the open air without shelter from the sun. The advantage of this unit is the ability of precise additive injection of two kinds of fertilizer or one fertilizer and acid - separatly.In order to prevent clogging, reduce wear of mechanical parts and extend the life of the system - the filtration unit is installed at the input of fertigation unit. At the output of block fertigation also installed a filtration unit for final fine water filtering with fertilizer. 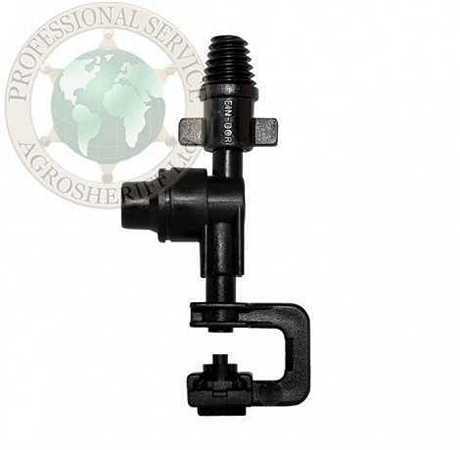 1	Binding manifold PP 1 set	Agrosheriff Ltd. company constantly developing its products in order to improve its performance, efficiency and functionality, and therefore the company reserves the right to minor changes in the binding configuration. Fertigation unit FertyNorm Compact-3S-PVC-CTFertigation unit FertyNorm Compact-3S-PVC-CT for proportional dosing addition of fertilizers and acid in the irrigation water in greenhouses of small and medium-sized, small areas of open field. 7 - 2500 l/h Water pressure0.2 - 8 bar Working temp +4ºС - +40ºСAttention! System operation is allowed only at positive temperatures. The drop in temperature below 0 ° C may cause defrosting and system breakdown.Fertigation unit comes as kit for self-assembly, allowing you to easily and quickly connect it to the water source and to the irrigation system using threaded connections. The advantage of this unit is the ability of precise additive injection of two kinds of fertilizer and acid - separatly.In order to prevent clogging, reduce wear of mechanical parts and extend the life of the system - the filtration unit is installed at the input of fertigation unit. 1Binding manifold PP 1 setAgrosheriff Ltd. company constantly developing its products in order to improve its performance, efficiency and functionality, and therefore the company reserves the right to minor changes in the binding configuration. 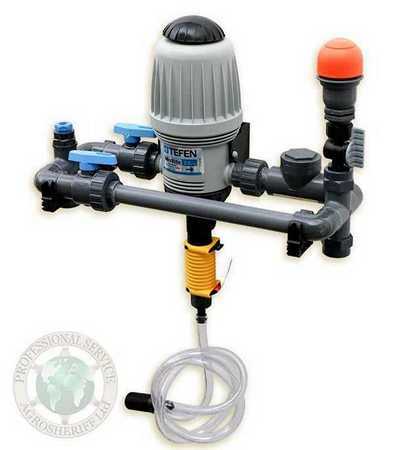 Node fertigation FertiNorm-3S + 1-PVC-2F-MAN Full Function node fertigation FertiNorm-3S + 1-PVC-2F-MAN is proportional to the metered addition of fertilizers in irrigation water in greenhouses small and medium-sized small volume for hydroponics. Node equipped with strainers blocks at the input and the output disk on the device that allows preliminary and final fine filtration of incoming water and outlet of the nutrient solution.Manual switching mode "fertigation" and the "flushing clean water irrigation mode"Specifications: Name	Parameter	Maximum performance (maximum flow rate) 2.5 m³ / hour	Minimum capacity (minimum flow rate) 30 liters / hour	Minimum Operating Pressure	1.5 atm Maximum operating pressure	6.0 atm	Working temperature	from + 5 ° to + 60 ° C	Attention! Operation of the system is allowed only at positive temperatures. Falling temperature below 0 ° C can cause defrosting and system breakdown. 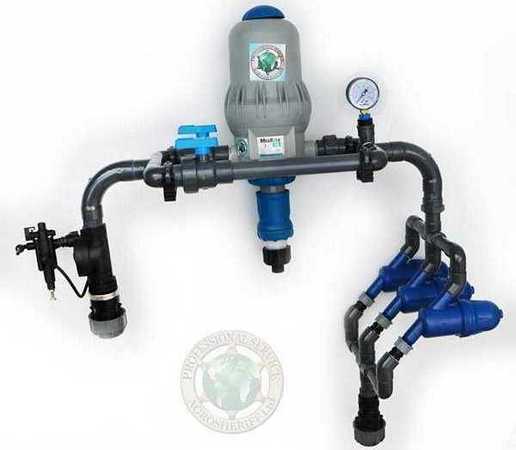 Fertigation unit comes complete with strapping, which allows to assemble it easily and quickly, and connect to a water supply and irrigation system using threaded connections. Cranes included in binding kit, intended for switching operation modes fertigation unit: watering and irrigating pure water with added fertilizer. 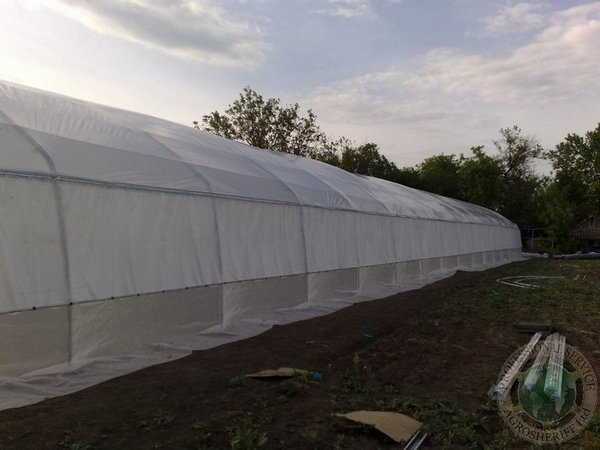 All items are made of polypropylene strapping with protection against UVA, which allows installation even in the open air without any additional shelter from the sun. The advantage of this unit is the ability to separate fertigation adding two kinds of acid to fertilizer + drip irrigation system and foliar plant micronutrients ssprinklernogo through the irrigation system. 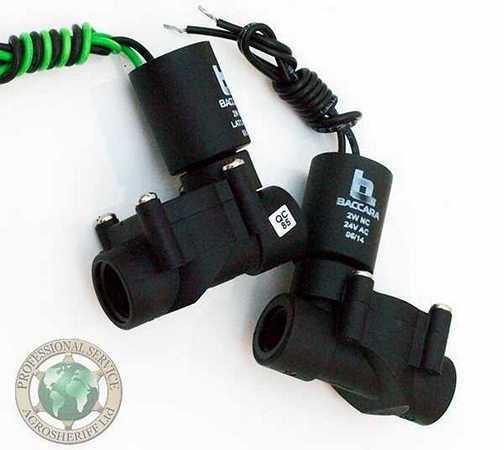 2 pcs Strapping on the basis of PVC valves and fittings	1 kit	Blocks fertigation Ana all versions are supplied directly from Israel. Delivered to any country in the world. Shipping cost is determined by the force at the time of delivery rates.Company Agrosheriff Ltd. constantly improving its products in order to improve their performance, efficiency and functionality, and therefore the company reserves the right to minor changes in the binding and configuration. Узел фертигации ФертиНорм-3S+1-PVC-2F-A+Полнофункциональный узел фертигации ФертиНорм-3S+1-PVC-2F-A+ предназначен для пропорционально-дозированного добавления удобрений в поливную воду в теплицах малого и среднего размера для малообъемной гидропоники. Предусмотрено автоматическое переключение режимов ''фертигация'' и ''промывочный режим полива чистой водой'',Технические характеристики:НаименованиеПараметрМаксимальная производительность: (максимальный расход воды) 2,5 м³/ часМинимальная производительность: (минимальный расход воды) 30 литров/ часМинимальное рабочее давление1,5 атм Максимальное рабочее давление6,0 атмРабочая температураот +5ºС до +60ºСВнимание! Эксплуатация системы допустима исключительно при положительных температурах. Падение температуры ниже 0ºС может привести к размораживанию и выходу системы из строя. Блок фертигации в сборе. Два узла фильтрации. Сетчатый фильтр на входе и дисковый на выходе. Спаренные фильтры повышают производительность работы системы, снижают гидравлическое сопротивление и удлиняют периоды между промывками фильтров.На фото слева Входные сетчатые фильтры с гидравлическим регулятором давления, поддерживающем уровень давления воды в системе.Справа - спаренный выходной дисковый фильтр, через который очищенный питательный раствор подается в систему капельного орошения. Блок фертигации поставляется в комплекте с обвязкой, что позволяет легко и быстро собрать его и подключить к источнику воды и системе орошения с помощью резьбовых соединений.Краны, входящие в комплект обвязки , предназначены для переключения режимов работы блока фертигации: полив чистой водой и полив с добавлением удобрений. 1 комплектКомпания Agrosheriff Ltd. постоянно совершенствует свои изделия в целях улучшения их технических характеристик, работоспособности и функциональных возможностей, в связи с чем компания оставляет за собой право незначительного изменения комплектации обвязки.Блоки фертигации Ферти всех модификаций, поставляются напрямую из Израиля. Доставка осуществляется в любую страну мира. Стоимость доставки определяется действующими на момент доставки тарифами.Компания Agrosheriff Ltd. постоянно совершенствует свои изделия в целях улучшения их технических характеристик, работоспособности и функциональных возможностей, в связи с чем компания оставляет за собой право незначительного изменения комплектации обвязки. 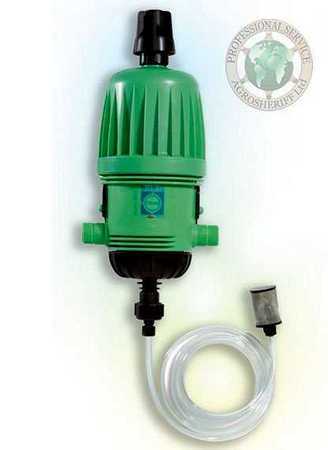 Proportional pump dispenser MixRite 2,5 m ³ / h fixed 0,8% is used for accurate dosing of various concentrated fertilizers and other additives in the water flowing through it .Capacity from 30 to 2500 l / hconnection size - male thread 3/4 inches.Application:In horticulture, horticulture, viticulture, and open field:addition of fertilizers through drip irrigation system provides optimum power plants. MixRite does not require external power sources. 4191 - MisterApplications: Used for germination, rooting and seedling. Also applicable for humidity controlled environment. The use of NDV (non-drip device) is highly recommended in order to prevent dripping when opening and closing the water, keeping the pipes full and shortening the pulsing cycle. And save water. GEVA 75 Inline valve 1" Electrical and Hydraulic pressure reducingGeneral DescriptionGEVA 75 1" control valves provide high hydraulic performances in fluid control. CLOSE: valve is kept closed.A minimum pressure differential of 1 bar is required. Fertigation unit FertyNorm Compact-2S-PVC-CTFertigation unit FertyNorm Compact-2S-PVC-CT for proportional dosing addition of fertilizers and acid in the irrigation water in greenhouses of small and medium-sized, small areas of open field. Controller GALCON GQ8100-2-4-6-8. Operation of 4 to 12 valves plus a master valve (or pump to increase the pressure). Operation of 2 valves simultaneously plus a master valve. Separate irrigation schedule programmable for each valve. Use of 24V AC electric valves. Operation by means of a 24V AC - 230V AC transformer (included). 9V battery program backup. Valve assignment to a lockout sensor. Irrigation duration: 1 minute to 12 hours with frequency once a day to once every thirty days or 1 second to 12 hours with frequency once a minute to once every thirty days (model S). 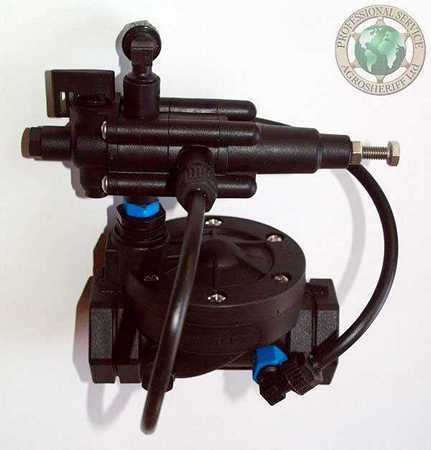 GEVA 75 Pilot Operated 3/8", 1/2" 2/2 Way NCGeneral DescriptionGEVA 75 pilot operated 2/2 Way NC solenoid valves are recommended for applications where high flow at high pressure is required. They can be used in control and automation systems The typical applications are: industrial furnace, heating equipment, burners, oil and gas, autoclaves, dental equipment, instrumentation, car washers, machine industries and irrigation.NotesMade of advanced technology plastics, synthetic elastomers, stainless steel and plastics resistant to corrosion. They work in a wide range of pressures. Manual override in all the valves with internal draining. Progressive opening and shut off which prevents water hammer. Very low head loss with high flows. Easy maintenance. Total access to the internal parts through the cover of the valve. 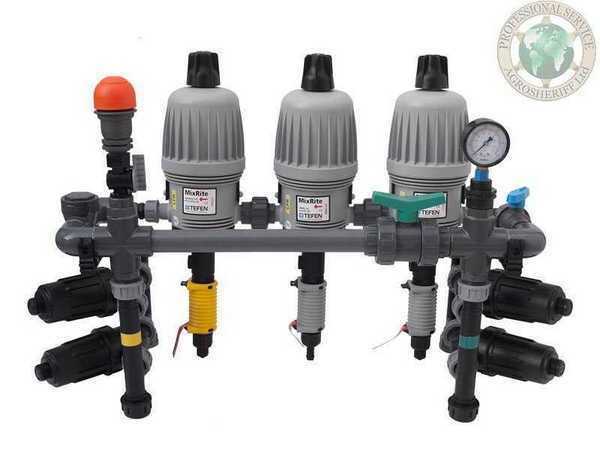 Wide range of possibilities such as electric valves, pressure regulating etc.Applications Electric remote control Farm and gardening irrigation Advanced computerized irrigation Filtration systemsFertilization systems Environmental controlThe working pressure is 12 bar. A minimum pressure of 0.5 bar is required for operation. To order valves manufactured to your specific requirements, please contact our technical sales department. Valves are a few modifications. Select the option you want for yourself: diameter, power supply, type solenoid.